The Swiss National Bank (SNB) will begin issuing the new 200-franc note on 22 August 2018. Following the 50, 20 and 10-franc notes, this is the fourth of six denominations in the new banknote series to be released. The current eighth-series banknotes will remain legal tender until further notice. The inspiration behind the new banknote series is ‘The many facets of Switzerland’. 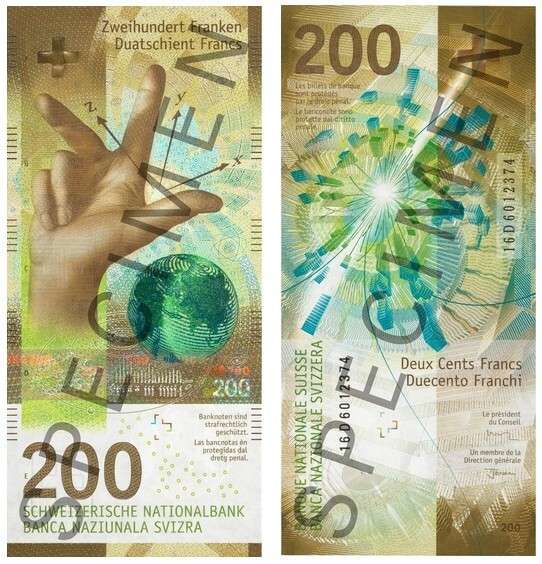 Each denomination depicts a typically Swiss characteristic, which is then illustrated graphically using a range of elements. 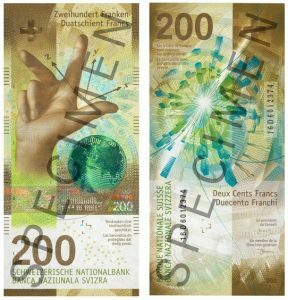 The 200-franc note focuses on Switzerland’s scientific expertise, as expressed by matter, the note’s key motif. Core design elements in the new series are the hand and the globe, which appear on every denomination. Тhe main colour of the new 200-franc note is brown. The next denomination, the 1000-franc note, will be presented on 5 March 2019 and enter circulation on 13 March 2019. The last denomination in the new series, the 100-franc note, is to be issued in autumn 2019.